Outputs a value sampled at the time of a trigger event. Outputs a value sampled from the 'New' input at a trigger event received on the 'Trg' input. 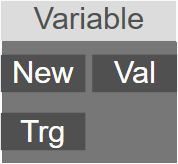 Trg: Trigger input (value is non zero). Val: The value of the 'New' input at the time of the last trigger event received on the 'Trg' input.